The Jacksonville Jaguars Radio Network is an 18-station radio network (10 AM stations and 8 FM stations plus 4 FM translators) based in the southeastern United States & is based in Jacksonville, Florida. 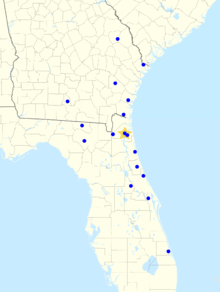 Beginning with the 2014 season, the network will originate at WJXL & WJXL-FM in Jacksonville Beach, Florida as well as WGNE-FM in Middleburg, Florida. Network programming consists of Jacksonville Jaguars pre-season, regular season & post-season games as well as a coach's show. WJSJ/105.3: Fernandina Beach, Florida (listed in 2013 as the Spanish flagship but station changed formats back to English-language). The commentary crew consists of 1010XL radio host Frank Frangie as the play-by-play announcer, and Jeff Lageman and Tony Boselli are the color analysts. ↑ Jacksonville.com. March 18, 2014: Jaguars switching radio coverage. Retrieved March 21, 2014. Network affiliates page on the Jaguars site. Communities listed may not be the stations' communities of license.